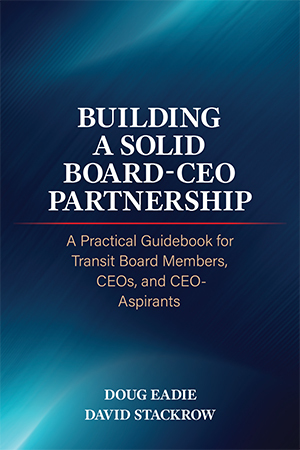 Your transit authority can expect to pay a high price for failing to develop a close, positive board-CEO partnership or for allowing it to deteriorate. For one thing, time will increasingly be spent bickering about minor matters, which will consume precious time that might otherwise be devoted to dealing with truly strategic questions that are at the heart of your authority’s long-term organizational stability and growth. The strategic agenda requires intensive, sustained attention at the top, and inadequate attention to the strategic issues in today’s rambunctious, often threatening world can leave your authority vulnerable to incursions from competitive systems and is almost certain to impede its efforts to grow. and might even threaten its organizational stability. In addition to the strategic price in terms of missed growth opportunities and loss of ground to competitors, a dysfunctional board-CEO relationship can damage the operational management of your authority. For example, important operational matters requiring board action that would normally be dealt with routinely by the board (for example, procurement and personnel actions) can suddenly take twice the time, as board members (being normal human beings) vent their frustration by nit picking items to death. A preoccupied CEO will have less time to work with his or her management team in resolving operational matters, which will accordingly suffer, and operational management is also likely to suffer from declining staff morale if the situation drags on very long. An eroding board-CEO relationship can also attract public attention, raising the specter of your authority’s image and reputation being seriously damaged. One of us saw this happen to the transit system of a large midwestern city, whose CEO grew increasingly estranged from a very strong board chair, and eventually from the majority on the board. Angry exchanges in the board room were widely reported in the local media, seriously tarnishing the once-stellar reputation of the authority, and dooming a critical sales tax issue that failed by a large margin. Since boards are highly unlikely to fire themselves because of a ruptured relationship with their CEO, the inevitable victim of the dysfunctional relationship will be the CEO, unless major repairs are made in time. Losing your authority’s CEO is one of the highest costs of all. The investment of time and energy that the board has made in working with the now-departed CEO will have gone for naught. Public attention to the rupture is very likely to tarnish your authority’s image, perhaps making it a less attractive joint-venture partner, a less desirable grant recipient, and even less of a magnet to attract senior-level staff. During the interregnum, of course, key strategies are likely to suffer from the absence of CEO direction, and anxious, insecure staff members will very likely be less effective at their jobs. 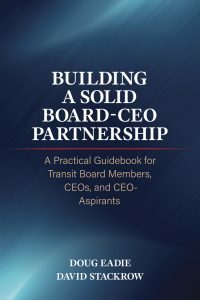 Add to this the high cost in time and money of going through another CEO search process and building a whole new relationship, and you can see the tremendous value of maintaining a positive board-CEO partnership.